This week's focus tangle on Square One is Meer. I have not used it a lot but it does have some interesting possibilities. I have to admit, I was not feeling particularly creative when doing this. I decided to keep it simple. I have seen some really creative uses of this tangle posted in the FB page. That being said, I am not disappointed with the way that this turned out. Probably one of the biggest challenges was trying to decide what orientation I would use to photograph it. Here is what I came up with. I hope you enjoy it. Shading done with #2 pencil. Came up with this when exploring different things to do with the "S" stroke. Was a conscious effort to see what it would look like using the same finish as Pea-nuckle. The concept of tangleations is one that is still somewhat unclear to me. This time it was a little clearer as I was deliberately trying to change the look of the tangle. However, does that mean that all ways of finishing this are also tangleations? When do they become different tangles? If you use the same basic structure but the finished tangle is entirely different is it still a tangleation. If you are looking for an answer, sorry but will not get it here. I think I have stated in an earlier post about now there are many tangles that start from the same basic structure. A lot are squares or combination of squares and lines. Bales is a good example as well as Dex and Florz. These are the ones that come to mind quickly. Is it a separate tangle because it looks different? Or is it a different tangle because it was not an intentional attempt to change the tangle? Is it a tangleation because it starts with the same basic structure no matter what it looks like at the end? Again, wish I had some answers. Here is the definition of tangleation from the Zentangle® website. A variation of a tangle by itself or in combination with one or more tangles. Basic tangles are like paint out of a tube. Tangleations are the result of altering a tangle, or mixing one or more basic tangles together in different proportions. Not sure that helps a lot. Oh well. Just more grist for the discussions on the FB pages. Here is the step out. Here is a picture of something from my journal and a bookmark. Are these tangleations or new tangles. Would be interested in your thoughts. Diva Challenge #223:"Official Tangle - UMBLE"
This week's Diva Challenge uses one of the tangles that is in the Zenthology, Umble. It was also the focus recently in the Zentangle® newsletter. I have not used it a lot. I think I first saw it in Sandy Steen Bartholomew's Alpha Tangle book. It is interesting as it uses the hollibaugh effect but the rest is pretty basic. This being the case I did want to change it up a little. Also did it on a Renaissance tile. Have been using mostly the original tiles as most of what I have been doing and posting has been on the Square One FB page and that is all you can use. I did remind me though that each tile takes pencils differently. The Renaissance tiles are a little thinner and do not necessarily do layering of colored pencils that well. Had some difficulties with the paper flaking. Did not cause major problems, but just had to be careful. This is what I ended up with. I hope you enjoy it. Inside are Dew Drops. The shading/highlighting is done with lays of Irojiten colored pencils. The bottom layer is Lightning Yellow, the next is Bamboo, and the last is Maple Sugar. If I felt the paper would take another layer I would have tried a red tint to get closer to the brown micron but did not want to chance it. Have not looked at many of the other posts, only seen those that showed up on my blog reader. I had all ready started mine when I saw them so was all ready set on what I was going to do. If you have not all ready been to I am the Diva, would strongly recommend you do so and look at the great art submitted by all the other participants. Try it yourself and take a real plunge and post your own. I am posting this with a little trepidation. Just recently checked out a site that is stealing peoples' images and then selling them on posters. This really makes me angry as some of the images were posted within the last couple of weeks. Do not really know how many of mine are on their site, but saw probably about 10 before it stopped letting me look at images. Do not know if they have sold any posters using my images. I would post a message to them in this blog but I am sure they do not read the blog they just steal the images. The information that I read indicates that it somewhere out of the US. Probably makes it impossible to do anything about it. Have to come up with some easy way to watermark my images so it will make it hard for them to use. Enough venting, on to the Focus Tangle. Those of you that have followed my blog for a while may be familiar with my different posts on using the basic stroke "S" as a basis for tangles. It began about 2 years ago when I was working in my journal. At the time I did not do anything to do step outs or even name anything. Part of that was deciding what, if any of them constituted a tangle or what was just patterns. Did not really feel like anything was that unique. Here is the page from my journal. You can see most of the ones from my journal on this bookmark. The one above Knightsbridge was a new variation. After I did it I began thinking about what it would look like if I varied the direction of the "S".Tried a couple of different things and that is how Opsess came about. I did a tile and posted on the Certified Zentangle FB site. Did not get a lot of feedback or comments but decided that it was different. Think the basic structure of the tangle leaves things open for a lot of variation. I have not played with a lot but here is the step out and a few variations. Here is the tile that I had posted earlier. The one on the top left was developed at the same time and is a tangleation of Pea-Nuckle. I have a step out of that in process and will post it sometime in the next couple of weeks. If anyone knows of Opsess by a different name, please comment on this post or message me. This week's focus tangle is Flux. I have not done a focus tangle for a while. Have too many other things demanding my time. When I saw that it was Flux figured that I could get something done before I need to focus on prepping for my class on Saturday. I enjoy doing this tangle. 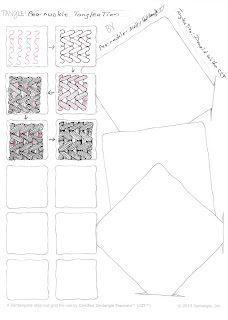 I also use it regularly in my Basic class as it is a good tangle to demonstrate the flexibility of Zentangle®, and that there are no mistakes and no hard and fast rules. Rick and Maria have very different ways of doing this tangle. I liken it to the different fonts on a computer. Commas, apostrophes and quotation marks look different in different fonts but we still see them as the same thing. Both ways of doing this are recognized as the same tangle. Here is what I came up with I hope you enjoy it. Tangles used: Flux- both versions, Scroll Feather, Ahh, Antidots, & Featherfall. I do not know if the vine with Antidot has a name or not. Has been awhile since I did any bookmarks. They are usually easy to do and do not take a lot of time. Had been working on a number of other things so wanted to do something just for fun. Other than the Knightsbridge at the bottom, none of the patterns have names as for as I know. They are the result of something a did a while back that I called S-plorations. I basically started with the basic element of an S and just tried to come up with different things to do. Can see these and some other examples by clicking on My Tangles tab on the top of the page and scroll down to the S-ploration entry. There are some basic shapes and then some embellishments added. Here is what I did. I hope you enjoy it. Have not really decided if I am going to add anything to the top. When I got done with the last one, noticed that it had gotten a little wonky. Not sure what to do to finish it off. May do some Tipple or maybe even Jetties. Diva Challenge #221: " Beads of Courage"
This week's Diva Challenge is one that occurs yearly. It is to bring attention to the Beads of Courage program. I think that it originally started around kids with cancer but has been expanded to include any child that has a condition that necessitates numerous and ongoing medical evaluations and procedures. The Diva's youngest son has Moebius Syndrome, a neurological disorder that impacts facial muscles. Some things that we take for granted, can be difficult to do, like sucking. It also results in his system being prone to infections. Anyone that has read her blog knows the strain that this puts on her family as well as others. The Beads of Courage gives these kids a glass bead for every medical procedure that they go through. These kids can have yards of beads. I have participated in this challenge a couple of times. I was not sure that I was going to get anything done this year. I happened to have some time at work today because of no show/cancelled appointments so I decided to start something. I did not plan on using a black zendala tile but when I opened my tote that I use to carry my pens and tiles, this was the only one unused tile I had. Luckily I also had my container that had my metallic gel pens in it. Kept it simple. Not sure if I will do another one or not. Here is what I came up with. I hope you enjoy it. I forgot how you have to be careful with the gel pens as the ink does not dry as quickly as the Microns. Resulted in a few smudges until I finally was aware enough. In keeping with my practice of using the first tile I complete, I did not start over. Did not really use a lot of tangles. Did a few Cruffle and Printemp circles. Threw in a few Indy-rella for variety. The rest is just line work. Will be interesting to see what others do. This usually results in some pretty cool tiles. I have not looked at any of them yet, and hope I have time to see them all. Not sure how much time I will have to comment on peoples' tiles. If you have not visited the Diva's blog click here so look at all the other great pieces of art. I started this ZIA about two and a half years ago. I was just getting into using color and experimenting with water color washes. It was also my first attempt at working on a large piece of paper. I did it in small increments. It got put aside as I worked on other things. I would see it a lot and tell myself I needed to finish it but never really sat down and worked on it. It has been about 70% done for a while. Just needed to finish some of the fill on tangles and decide about shading and highlighting. That could have been a part of the delay as I was not sure what I wanted to do on this. Finally decided that I just needed to sit down and do it. If I were starting on this now, I would have done some things differently. Mostly because I have learned a few things since I started this. Probably one of the main ones is that I would have used the different color washes as strings rather than having the tangles cross over so many of the different colors. I think it would have added a little more continuity to the piece. Also maybe would have used different colors. Not quite as much variety. That does not mean that I am not pleased with it. It forced me to do some things in a little bigger fashion than what I usually do and what I am comfortable with doing. Enough rambling. Here is what I came up with. I hope you enjoy it. Tangles used: Knightsbridge, Mooka, Msst, Cadent, Sanibelle, Marasu, 'Nzeppel, Eye-Wa, Shattuck, Purk, Quib, Tripoli, Striping, Finery, Chainlea, Onomato, Cubine, Meer, Zinger, Poke Leaf, & Zander. Water color wash and highlighting was done with Derwent Inktense Pencils. Graphite shading done with a 4B pencil. The tangles were completed with Microns. Used black, brown, and sepia. The paper is 11" x 14"
Diva Challenge #220: "All Boxed Up by Alice Hedon, CZT"
This being the first of the month, the Diva Challenge is a UMT, use my tangle, challenge. This time it is a tangle by Alice Hendon, CZT called All Boxed Up. The uniqueness of this tangle comes out with the shading. This is true even though what it was based on did not have any shading it was wall art. There is a picture, along with the step outs and some great tiles using the tangle on her blog, The Creator's Leaf. I did not get to this as early as I had wished. It is late Thursday night and I am just getting it posted. Correction it is early Friday morning. The only reason I am still up is that I do not have to go into the office tomorrow. Was not really sure what I wanted to do with this tangle. 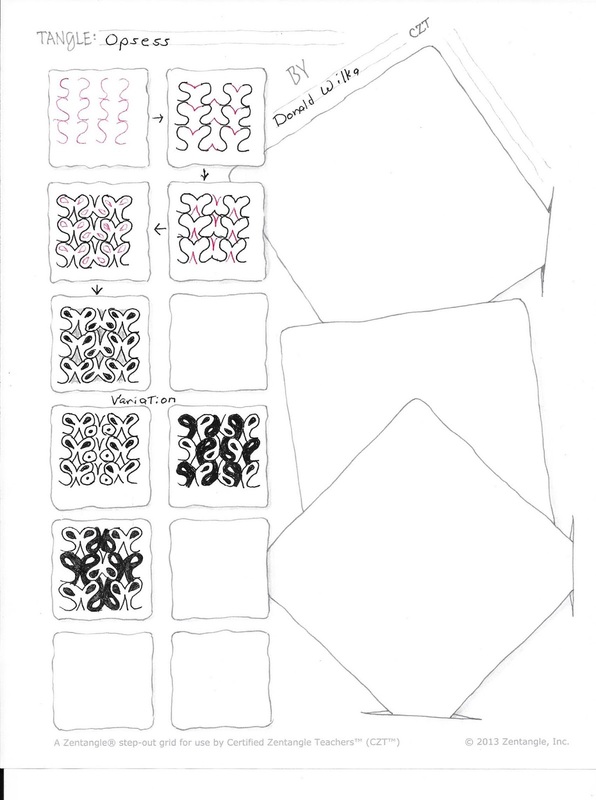 I decided to go with true Zentangle® method and just start with no planning and let this build on its own. Maybe that is why it took me longer to do. One thing that was a little more purposeful is that I wanted to try Narwal, a tangle that I had not tried yet. Enough rambling about things. This is what I came up with. I hope you enjoy it. Tangles used: All Boxed Up, Cadent, Florz(variation), Narwal, and Genoa. There was a discussion on one of the groups about what the definition of a tangle is. Someone suggested that Narwal was not a tangle because it used a pencil string and tangles are not suppose to use grids or things to complete them. Not sure about that but wanted to see if I could do Narwal without the pencil string. I was able to accomplish it. I have to admit I did have to watch the video as I was doing it. I do not think it turned out too bad for a first attempt. If you have not done so all ready, would strongly encourage you check out the tiles and ZIAs posted on I am the Diva. I have not had a chance to look at very many. Usually just ones that show up in my reader or when people have also posted them in one of the FB groups. Thanks for visiting. As always, comments are welcomed,encouraged, and appreciated.